Gibsons Landing is the Gateway to the Sunshine Coast, located 30 kilometres northwest of Vancouver. 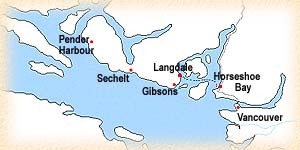 We can be reached by a 40 minute ferry ride across Howe Sound from Horseshoe Bay to the Langdale ferry terminal. If you would like to learn more about the Sunshine Coast B.C. Sunshine Coast Tourism provides commentary about diving, hiking and other activities or sunshinecoastcanada.com/.